Enjoy the ocean views as you take a refreshing dip in the outdoor pool or Jacuzzi. 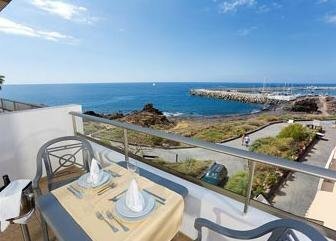 You can also soak up the warm sunshine at the nearby beach – only 150 metres from the Gema Aguamarina Golf. As a guest of this property you can take advantage of the wide facilities available at the sister hotel, just 50 metres away. 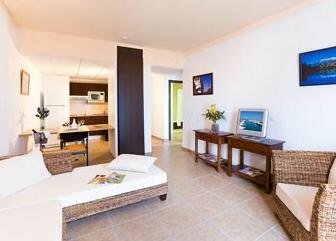 Here you can spend a session in the gym or sauna before relaxing in the tropical gardens or heated indoor pool. You will also find a restaurant, another outdoor pool and beach club – perfect for enjoying the year-round sunshine. 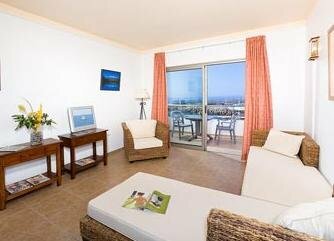 The lively resorts of Playa de las Américas and Los Cristianos are both found within 18 km of the Aquamarina Golf. The building’s U shape means that every apartment boasts ocean views. Each one comes with a bedroom, separate lounge-diner, bathroom and separate shower unit. The lounge area opens onto a furnished balcony. Bathroom cleaning is provided 7 days a week. Towels and bed linen are changed 3 times weekly. Restaurant, Bar, 24-Hour Front Desk, Garden, Terrace, Non-Smoking Rooms, Rooms/Facilities for Disabled Guests, Family Rooms, Elevator, Luggage Storage, Shops in Hotel, Gay Friendly, All Public and Private spaces non-smoking. Tennis Court, Sauna, Fitness Centre, Golf Course (within 3 km), Children's Playground, Billiards, Table Tennis, Darts, Indoor Swimming Pool, Outdoor Swimming Pool. Meeting/Banquet Facilities, Business Centre, Laundry, Dry Cleaning, Barber/Beauty Shop, Ironing Service, Currency Exchange, Souvenirs/Gift Shop, Packed Lunches, Car Hire, Tour Desk, Ticket Service, ATM/Cash Machine on site.